David Fowlie reports on the special presentations he saw at last week's Star Wars Celebration in Chicago. A review of the video game The Division 2. 30 Minutes on: "As Good As it Gets"
"As Good As it Gets" was on cable TV tonight and I watched it all the way through while doing other things. I think that's how it was meant to be watched, like really good but not particularly ambitious television. 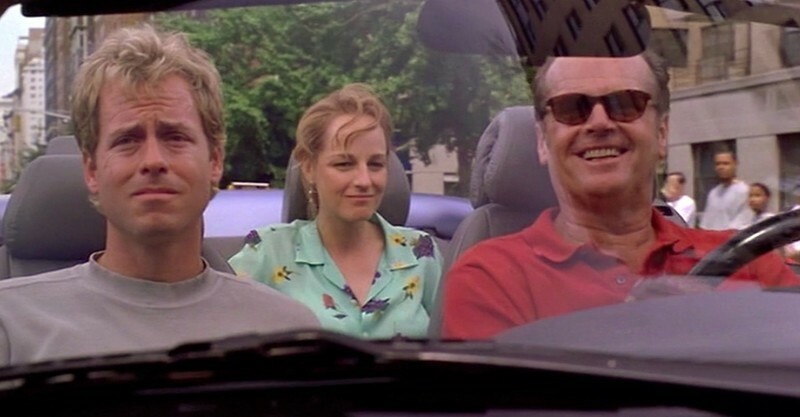 It's about a millionaire writer with obsessive-compulsive disorder (Jack Nicholson) who falls for a coffee shop waitress (Helen Hunt) whose cute son has asthma and somehow ends up taking care of an adorable little dog that belongs to a gay painter (Greg Kinnear) after the painter gets savagely beaten. I remember being pretty tough on the film when it came out—I was in my late 20s and had only lived in New York for two years after emigrating from Texas, so maybe I was trying to seem more hardbitten and urban—but the first thought that came into my head during tonight's re-watch was, "I can't believe there was a time when a movie like this could make $314 million in North America." Written and directed by James L. Brooks ("Terms of Endearment," "Broadcast News," "Spanglish"), the movie is comprised mainly of scenes where people talk to each other. None of these characters are particularly striking individuals (except for Nicholson's Melvin Udall, who makes a vivid impression mainly because he's such a cranky a-hole at every waking moment), and while they all have their personal crosses to bear, none of them has a problem that you would call extraordinary. They live in something vaguely like reality (though the apartments are way bigger than people at these income levels could afford, except for Melvin—but when is that not true of New York movies?). Features like this don't find their way into theaters very often anymore unless they're funded by Netflix or Amazon and the theatrical release is a formality and a transparent bid at Oscar recognition, or if they're in French with English subtitles and play on four screens in three cities. Or if they're a television show. And increasingly, that's what stories like this have to be if they want to find funding and an audience: television shows. Somewhere during the last twenty years, the motion picture distributors and exhibitors successfully trained audiences not to want to leave their homes unless they're seeing a "Star Wars" or superhero movie, a film where giant robots or giant monsters wreck things, one one of those little horror movies or comedies (like "Don't Breathe" or "Get Out" or "Girls Trip") that somehow manages to connect with the zeitgeist anyway and make a bazillion dollars. I love television and write about it all the time, but I still think it's a shame that, by and large, people won't leave their homes for films like this anymore unless there's a wild-card genre element stirred into the mix. But if you have a really nice TV and don't want to pay for parking and/or a babysitter, I get it, believe me. "As Good as It Gets" is very likable despite being too long and misshapen. I know it's a standard knock on writer-director James L. Brooks to say that he makes excellent sitcoms for the big screen, but this one really does feel like five sitcom episodes smooshed together; each discrete section of the story runs about 30 minutes, and there's even a very special "road trip" episode that sends the three main characters to Baltimore when they barely know each other. There are epiphanies and revelations and moments where people come to terms with their demons, or think about doing so. Melvin and Carol are easily twenty years apart in age (during shooting, Hunt was 34, Nicholson 60) and physically she's way more attractive than he is. You believe that they might eventually end up together because Melvin is played by Jack Nicholson and the character is loaded and she desperately needs medical care for her son. And also because he abases himself near the end in a way that is rather appealing, though calculated and very much written. Sorry to be cynical about it, but there's not much going on at the chemistry and character levels between these two: you know why he likes her, but it's hard to say why she likes him when all he does is insult people, complain, and sometimes mope. Plus he's casually homophobic in a way that read as merely "blunt" or "politically incorrect" in 1997 (to certain straight viewers, anyway) but that would seem like deal-breakers to anybody who was thinking about being pals with Melvin in 2017. No, I'm not saying every character in a film has to be likable, so don't come at me with that, please; I'm saying there are some unexamined assumptions at the heart of the idea that this guy is "relatable" to everyone and that Kinnear's character, Simon Bishop—who must spend quite a bit of time in art galleries and hanging around bohemian people if he's a successful painter, would cut him so much slack—probably wouldn't put up with him to the extent that he does here, especially if he'd just recovered from a beating that put stitches in his face. There was probably a way to make all of this entirely comprehensible without waving that magic "Jack Nicholson, he's so wacky!" wand (which admittedly worked like gangbusters for about two straight decades), but Brooks never gets there. Not that audiences cared. Or the Academy, which gave the film seven nominations and two awards, for Nicholson and Hunt. Nicholson later gave an interview where in answer to the question "Why did you take the part," he replied, "Because I read the script and said, 'If I play this part, I'm gonna win another Oscar.'" There are some marvelous, highly quotable lines, though, including "You make me want to be a better man" and "You're a disgrace to depression" and "I'm drowning here, and you're describing the water!" And there's that aforementioned nostalgia factor, for the days when this kind of project could be considered a "major release" during the holiday season even though it takes its sweet time exploring the world and defining the characters, and tries to generate suspense from scenes where the main character tries to walk down the street without stepping on any cracks, and succeeds. There are four compelling lead performances in this film, and one of them is by a dog. Respect. One of the best documentaries about acting you'll ever see. Roger Ebert became film critic of the Chicago Sun-Times in 1967. He is the only film critic with a star on Hollywood Walk of Fame and was named honorary life member of the Directors' Guild of America. He won the Lifetime Achievement Award of the Screenwriters' Guild, and honorary degrees from the American Film Institute and the University of Colorado at Boulder. Chaz is the Publisher of RogerEbert.com and a regular contributor to the site, writing about film, festivals, politics, and life itself.